Jeff Koons collaborated with Google to create the limited edition Jeff Koons Live Case. 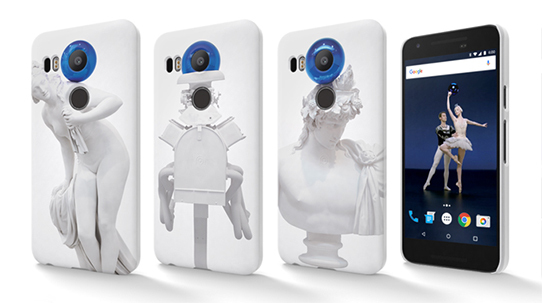 Koons created three Live Case designs for Google’s Nexus 6P and 5X phones, each featuring a sculpture from his Gazing Ball series: Diana, Mailbox, and Antinous-Dionysus. For the Live Wallpaper—a unique feature included with the case—Koons directed and produced his first ever live-action video piece: A classical rendition of the ballet Swan Lake featuring a Gazing Ball. The interactive wallpaper displays a still image of two dancers poised on a set designed by Koons. When the screen is tapped, the dancers perform a short choreography sequence from the ballet before returning to a resting position. There are twenty-eight sequences, all of which have been selected and edited by Koons, which rotate daily in a continuous cycle. This Gazing Ball Ballet was the first interactive wallpaper of this nature ever created. Beer, Jeff. “Your Chance To Own Original Jeff Koons Art, Courtesy of Google’s Nexus Live Case Line.” Co.Create 12 May 2016. Betker, Ally. “Jeff Koons, the Google of the Art World, Teams Up with Google.” W Magazine 10 May 2016. Domirez, Darren. “Google Nexus Features Limited-Edition Jeff Koons Exhibition Live Case, His Cheapest Artwork Price Ever.” University Herald 12 May 2016. Elizalde, Molly. “Snapchat Discover Channel: Sweet Culture.” Sweet, May 11, 2016. Embuscado, Rain. “Jeff Koons Debuts First Live-Action Video Work with Google.” Artnet News 10 May 2016. Fenner, Justin. “Jeff Koons Just Released His Most Affordable Work Yet.” GQ 10 May 2016. “For $40, you could own a Koons.” The Art Newspaper 19 May 2016. Garcia, Patricia. “Jeff Koons’s New Artwork Is Surprisingly Affordable.” Vogue 9 May 2016. “Get your limited-edition Jeff Koons Live Case today.” Android 10 May 2016. 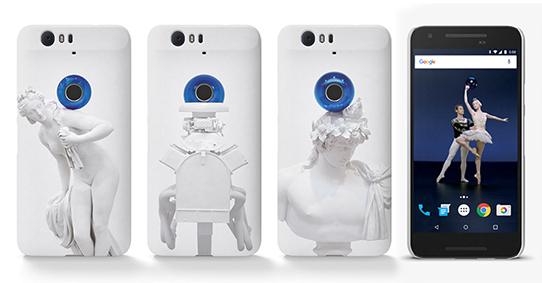 “Google introduces trio of Jeff Koons-designed Nexus Live Cases.” Phone Arena 10 May 2016. “Google teams up with Jeff Koons for limited-edition cases.” Yahoo! 11 May 2016. Green, Amanda. “Be Part Of Art History – Win A Signed Jeff Koons Phone Case & A Nexus 6P.” Refinery 29 2016. “Jeff Koons art… on your phone?” FlipSide PA 11 May 2016. “Jeff Koons designs Android cases for Google.” Fast Company 10 May 2016. Kastrenakes, Jacob. “Google teams up with artist Jeff Koons for limited-edition Nexus phone cases.” The Verge 10 May 2016. Lee, Tyler. “Google Introduces Limited Edition Live Cases By Jeff Koons.” Ubergiz mo 10 May 2016. Li, Abner. “Google announces limited-edition Jeff Koons Live Cases for Nexus 5X and 6P.” 9 to 5 Google 10 May 2016. Maiberg, Emanuel. “A Critique of Jeff Koons’ Nexus 6P Case.” Londonist 21 May 2016. Myrick, Andrew. “Google and Jeff Koons partner up for a new Nexus Live Cases to be unveiled tomorrow.” Phandroid 9 May 2016. Scheffler, Daniel. “Another day that art collided with technology.” Selections 11 May 2016. Sidell, Misty White. “Jeff Koons and Google Unveil Phone Case Collaboration.” WWD 10 May 2016. Torres, JC. “Limited edition Jeff Koons live cases bring art to the Nexus.” Slash Gear 11 May 2016. Whitwam, Ryan. “Limited Edition Nexus Live Case By Artist Jeff Koons Will Be Available Starting Tomorrow.” Android Police 10 May 2016.